Rising energy costs and concerns over climate change have ushered in a new era of awareness for the need to conserve energy. While this focus on energy conservation is welcome, homeowners are bombarded with marketing pitches for a wide variety of home energy improvements and "green" products. One simple fact rises above the confusion—nothing is more important for reducing energy consumption, lowering utility bills and minimizing the environmental impact of a home than proper insulation. when a house is properly insulated it keeps the temperature inside, whether hotter or colder, constant by controlling four key factors that cause heat transfer. Heat moves into, out of and through a home in four ways: by conduction (which R-Value measures), and by convection, radiation and air infiltration (none of which are measurable by R-Values). 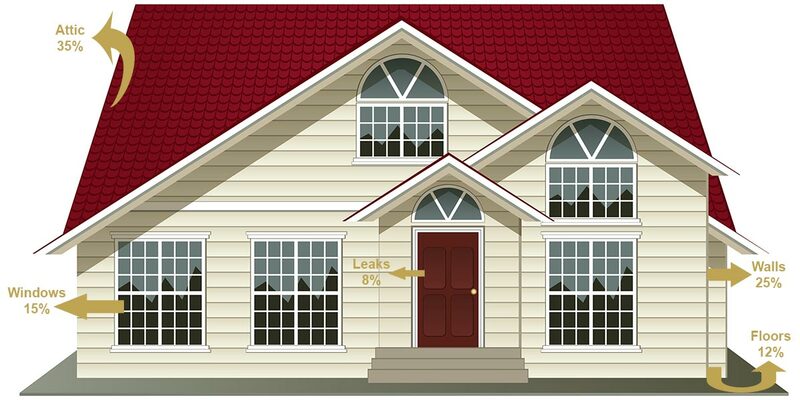 A superior insulation system will have a high R-Value (prevent heat transfer via conduction), will be pneumatically or spray applied to fully fill the building cavity (preventing heat loss via convection), and when installed in closed cavities will be densely packed (preventing heat loss via air infiltration and radiation). 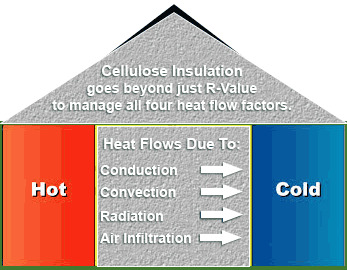 Cellulose insulation meets all four of these critical performance criteria! Properly insulated homes are warmer in the winter and cooler in the summer. In addition, insulating attics, exterior walls and interior walls between rooms provides better Sound Control to make the living environment event better for homeowners.